Unripe or ripe fruits. 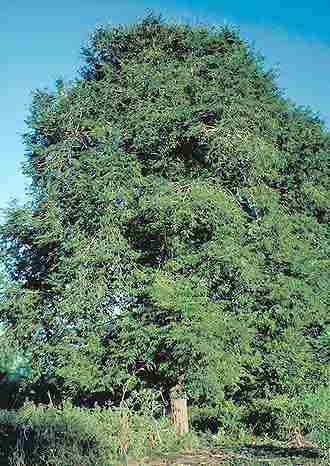 Com­mon­ly, the pulp of ripe pods is ex­tracted in water to yield tamar­ind water . Sour, tart and very fruity; sweetness is hardly discernible in the common varieties. See mango on the topic of acid­ity. Ripe tamar­inds contain sugars (35 bis 50%), whose sweet taste is, how­ever, out­weighted by up to 20% tartaric acid which has an intensively acidic taste and depresses the pH down to 3.15. 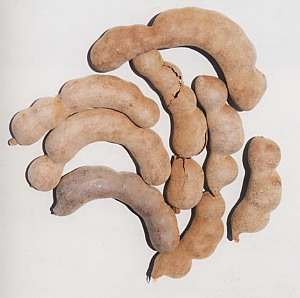 Some cultivars of tamarind decompose the tartaric acid on ripening ( sweet tamarind ) and can be eaten raw as fruit. 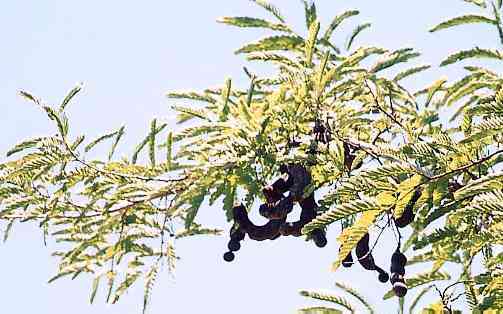 Tamarind fruit is rich in some metal ions (calcium, potassium, zinc, iron). 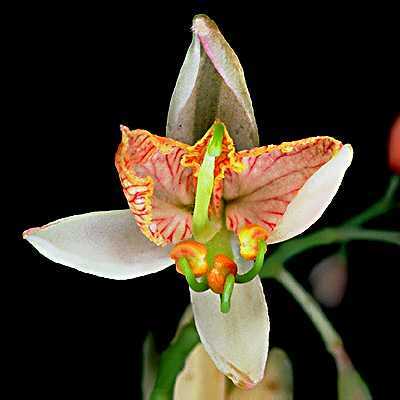 From Eastern Africa, but now growing all over the tropics. 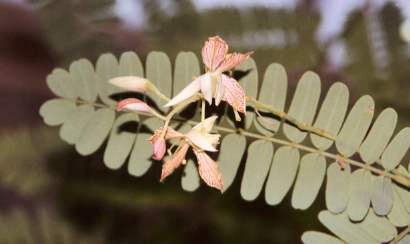 Englisch tamarind is based on the Arabic name of that plant, tamr al-hindi [تمر الهندي]. 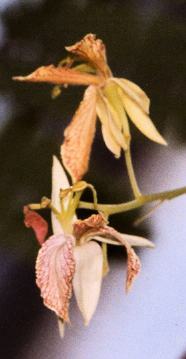 Similar or identical names are found all over Europe, e. g., Swedish, Estonian and Russian tamar­ind [тамаринд], Spanish and Italian tamar­indo and Greek tamarin [τάμαριν]. Turkish demir­hindi shows a slight variation of sounds. Arabic at‑tamr al-hindi [التمر الهندي] simply means the date of India ( date being a general name for the fruits of various palm trees); need­less to say, tamar­ind neither stems from India nor is it related to palm trees. In spite of this defi­ciency, loan trans­lations of this name have made their way into some languages like English (Indian date), German (Indi­sche Dattel), Hungarian (Indiai datolya) and Russian (Indiyski finik [Индийский финик]), although they are not much used in modern speech. German also has obsolete Sauer­dattel sour date . 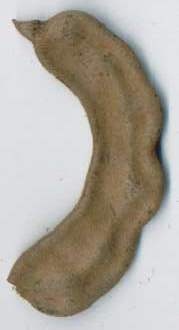 The term date itself came to English via Old Provençal datil and allegedly goes back to Greek daktylos [δάκτυλος] finger ; this naming, obviously motivated by shape resemblance, seems even more fit for tamarind than for true dates. See also turmeric for the etymology of India . 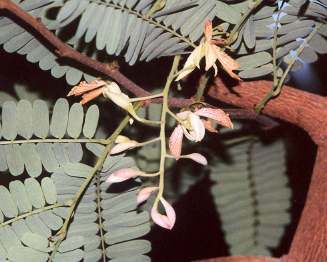 Tamarind is the only im­por­tant spice of African origin. Today, it is a much-valued food in­gre­dient in many Asian or Latin Ameri­can recipes. The sour and fruity taste of tamar­ind merges well with the heat of chiles and gives many South Indian dishes their hot and sour character, and their dark colour. In India, tamar­ind is mostly com­bined with meat or legumes (lentils, chick peas or beans). The pulp is sold dry and must be soaked before usage. Only the water is then added to the food. 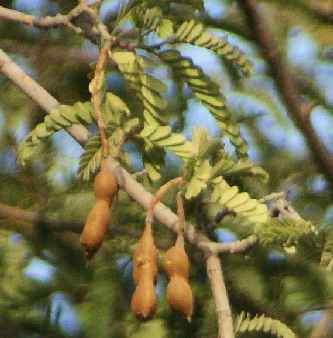 Alternatively (and more comfortably), tamarind extract may be used with the same effect. A well-known example of a Southern Indian dish employing tamarind is vindaloo (vindalu [विंदालू]), a fiery pork stew from Goa. Goa is an Indian union state on the West coast with a large proportion of Christans, having been a Portu­guese colony until the 1960s; as a Portu­guese heritage, pork is very popular in Goan cooking. Basically, vindaloo is a spicy, tropical version of Portu­guese porco vinho e alho (see garlic): Pork is marinated with a paste made from vinegar (instead of the original wine), ground onions, garlic, ginger and a host of spices (chile, cloves, cinnamon, pepper, cumin, toasted black mustard seeds) for several hours and then, together with the marinade and tamarind water, stewed until tender. Variants with poultry instead of pork are popular with Hindus and Muslims. Outside of India, the recipe is often bastardized by adding potatoes due to confusion with Hindi alu [आलू] potato . Another South Indian food employing tamarind is the vegetable rice dish bese bele from Karnataka (see coconut). Soups in the Euro­pean sense have no tra­dition in India; yet all South Indian states enjoy a special kind of spice broth with a delight­fully fresh, tart and spicy flavour; it is known as rasam [ரசம்] in Tamil and as saru [ಸರೂ] in Kannada. It consists of a long and slowly sim­mered broth made from fresh (cori­ander, curry leaves, gar­lic, ginger and dried (cumin, cori­ander, chiles, pepper) spices plus some red lentils and a good amount of tamarind. Before serving, some more fried spices may be mixed in, or alter­natively a few tomato slices or (preferred in Andhra Pradesh) a few dark brown, crispy fried dried chiles may enter the pot. Rasam is eaten with rice, like any curry. Mulliga­tawny soup, an Anglo–Indian recipe, is basi­cally an adap­tion of rasam aug­mented with boiled chicken meat, al­though con­tempor­ary recipes have gone a long way from that origin. On Jawa, Indo­nesia’s most popu­lous is­land, tamar­ind is taken as basis for spicy and some­times sweet pastes used to mari­nade meat or soy bean cheese (tahu) before frying. A typical mix­ture might con­tain tamar­ind water besides soy sauce, garlic and pos­sibly ginger and galangale; chiles, of course, are added up to taste. Jawanese food is unique in Indo­nesia for its sweet–sour com­positions, but the sweet–sour taste is much less dominant than in some Chi­nese recipes. 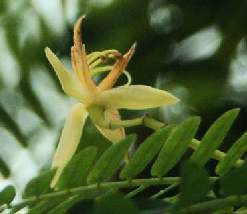 For the sour taste, tamar­ind is pre­fer­red to limes, and as sweet­eners palm sugar (see coconut) and the sweet soy sauce typical for Indo­nesia (kecap manis) are most popular. Other ingre­dients re­spon­sible for the parti­cular character of Jawanese food are fermented shrimp paste (trassi) and peanuts, which are ground to a paste and added to many sauces. Frequently, sweetness is more pronounced than acidity. Although only a small minority of Western con­sumers knows tamarind today, there is still one product con­taining tamar­inds that has gained some impor­tance in inter­national cuisine: Worcester sauce, which may be called Indian inspired in the same way as curry powder. See cloves for details. 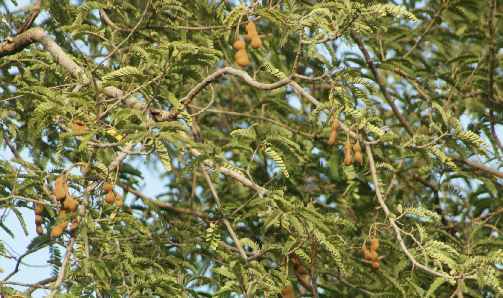 In peninsular Southeast Asia (Vietnam and Thailand), the pods are both used ripe and unripe; in the fresh state, their tartness is less fruity and more astringent. 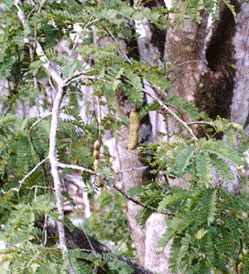 Fresh tamarind pods cannot be dried or otherwise preserved, except by deep-freezing. 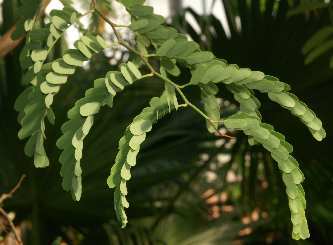 Tamarind is often used for acidic soups, which are very refreshing in the tropical climate of Vietnam and Cambodia. See also rice paddy herb.